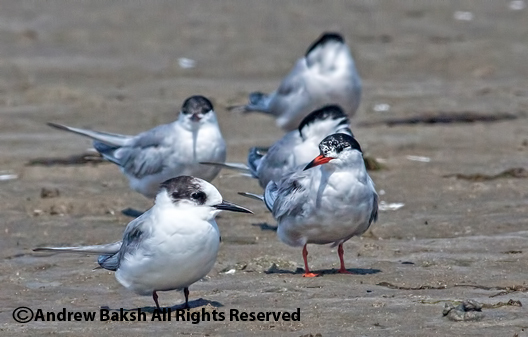 6+ hours of birding out on Eastern Long Island NY at Pikes Beach and the Cupsogue flats resulted in nice looks at two 1st Summer Arctic Terns and a nice looking breeding plumage Red-necked Phalarope (the latter found by Eileen Schwinn and Mike Higgiston). 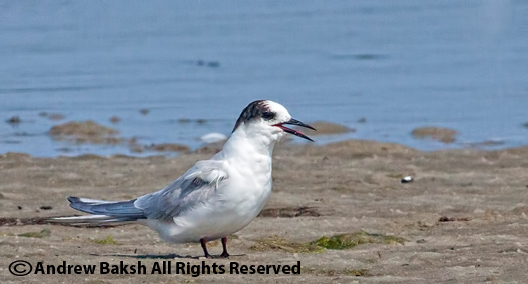 There were a few 1st Summer Common Terns in the area as well, so I had to be careful in picking out the Arctic Terns. 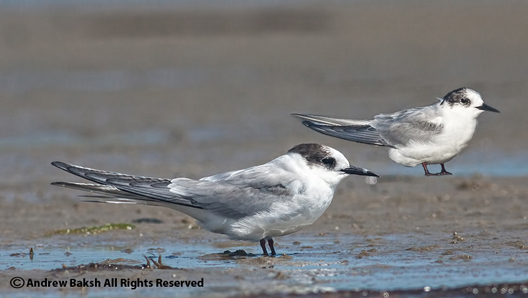 In addition to the Arctic Terns, there were 9 Roseate Terns and 1 immature Black Tern in the area. 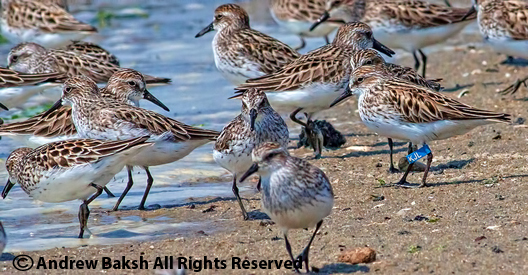 Certainly more shorebirds present today than last weekend, included Short-billed Dowitchers, Red-Knots and Western Willet. Here are a few photos that I managed to download. 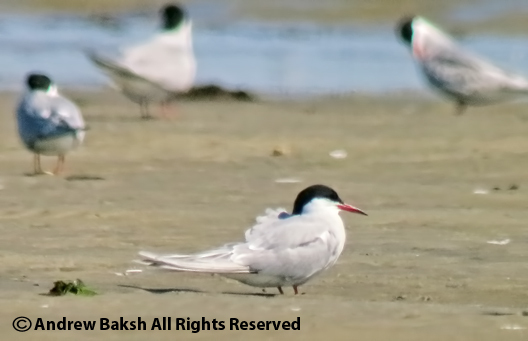 1st Summer Arctic Tern on front left. 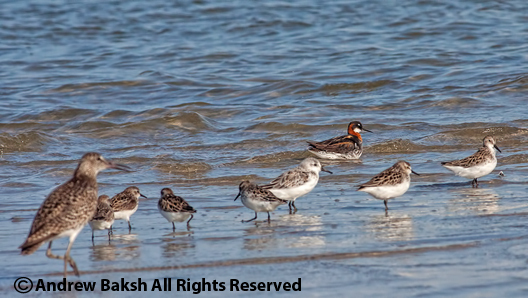 Digiscoped yesterday on the flats of Cupsogue LI. This is just one of many ARTE we had on the flats. Today we had at least 6. More photos to come. A picture tells a thousand words. 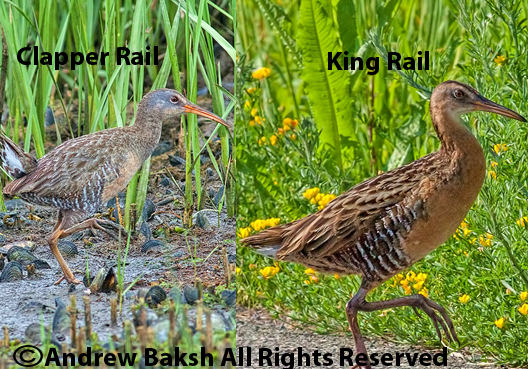 Some photos to help in identifying Clapper Rail from King Rail. Mississippi and Swallow-tailed Kites, are noted for wandering north of their breeding ranges in late May and early June. This has been a good spring for these overshoots, with at least 3 Swallow-tailed Kites reported in NY over the past month or so. My friend Tom Burke for weeks had been saying to me NY was bound to get Mississippi Kites soon; especially, with the recent emergence of the 17 year Cicadas. 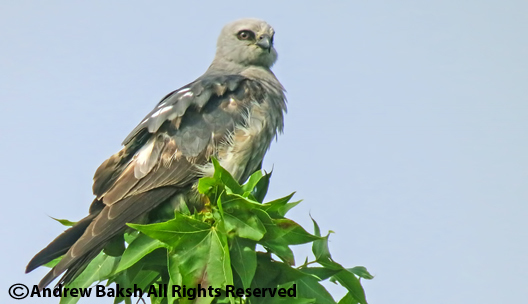 Tom and Gail Benson had been checking past sites where Mississippi Kites had nested such as Sterling Forest where a pair nested last year. Sporadic reports of a MIKI in Ulster County began to come through within the last two weeks, but no consistent site was established. 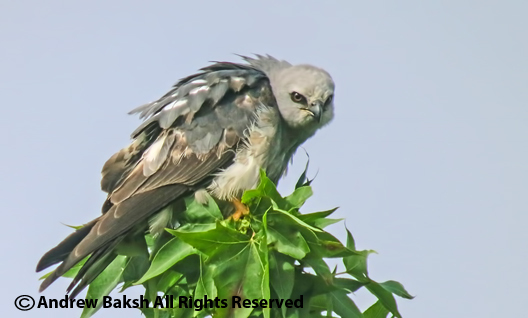 Then Anthony Ciancimino the Staten Island wonder kid who has this uncanny knack of finding all sorts of goodies in his birding patch reported a Mississippi Kite in...you guessed it. His birding patch, Cemetery of the Resurrection, and photos soon followed. 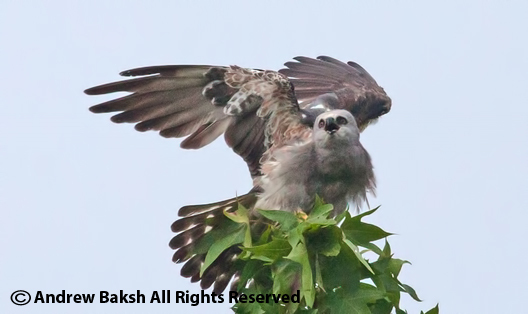 Coincidentally, New York State's first ever record of Mississippi Kite was from Staten Island 34 years ago when two showed up during a cicada emergence. So Tom Burke's prediction was spot on! I made it out to Staten Island on Saturday and had excellent looks at the MIKI (Mississippi Kite) and enjoyed listening to the humming of Cicadas. It was a pretty cool experience! 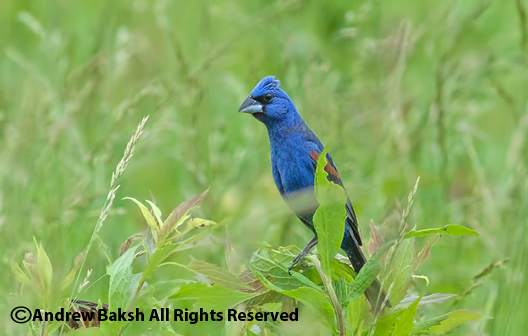 Later at Mount Loretto another interesting discovery was made with the sighting of a pair of Blue Grosbeaks in the fields south west of Mount Loretto. 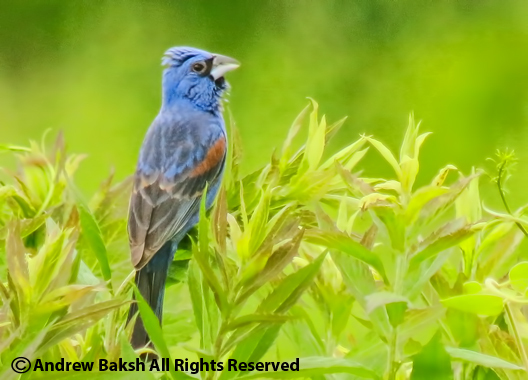 Significant again for the area as New York's first documented record of nesting Blue Grosbeaks was in Staten Island (Thank you Eric Salzman). 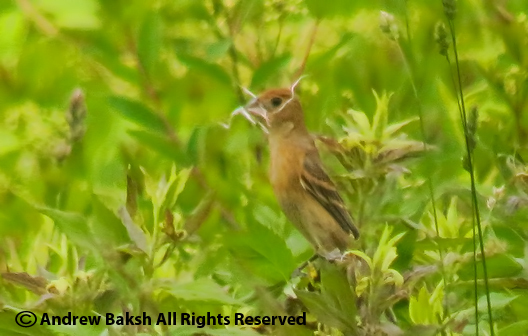 I managed a digiscope shot showing the female carrying nesting material. Let's hope the pair nest successfully. I have not done Wordless Wednesday or "today's photo(s) posts in a while, so for my faithful readers, this one should wet your appetite for more of those types of posts. 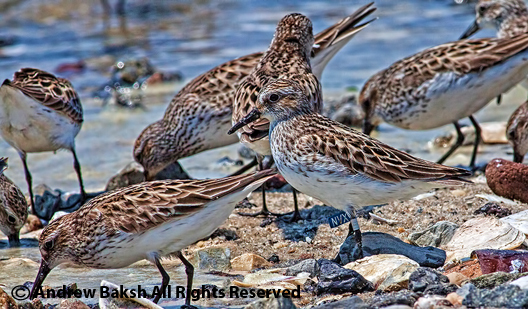 This was taken on the flats at Cupsogue Long Island while taking a break from studying Terns. 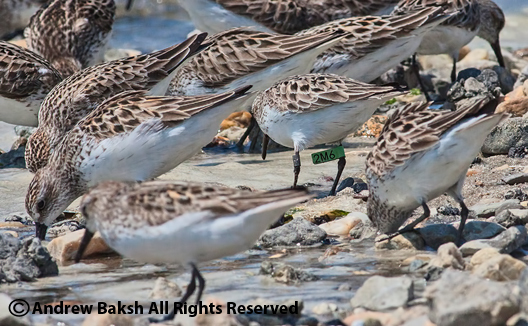 On Marsh 31st, I documented 3 additional Semipalmated Sandpipers noting their band numbers and color, but more importantly capturing digiscope photos. 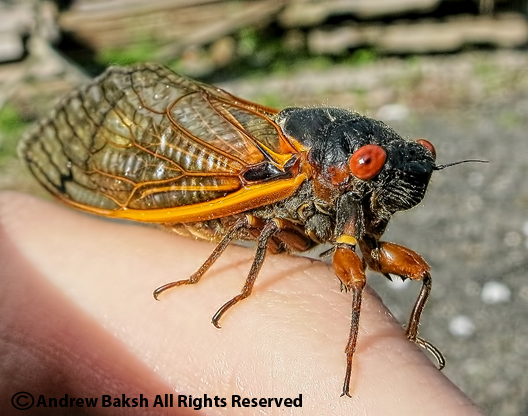 The information has been submitted to the NA Bird Banding Laboratory where I hope after a few days I will be able to map the re-sighting and post the information. 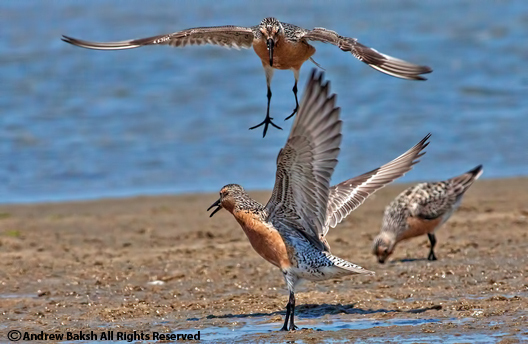 Last Saturday, I was at Big Egg Marsh in Queens birding for a bit in the morning and then decided to head north with plans to bird the Bashakill region. I had spoken to friends Tom Burke and Gail Benson earlier and thought it was possible to meet up and bird with them at some point. 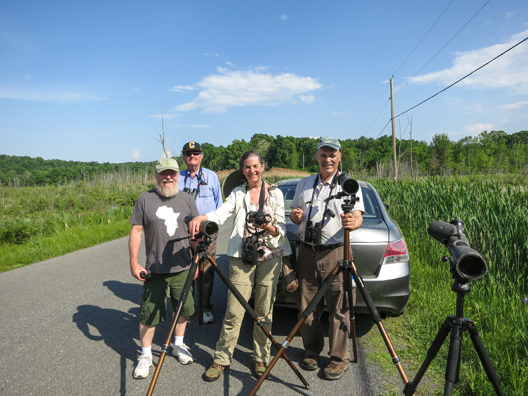 Well I did meet with them but it was to chase a King Rail that was reported in Ulster County. 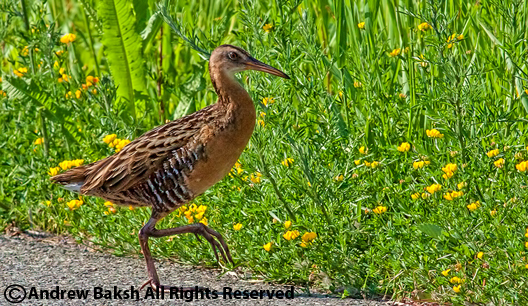 The King Rail would be a life bird for me and I wondered whether I had a chance at seeing it or would I have to be satisfied with hearing the bird. We decided to car pool and so I was riding with Tom and Gail when we made our first try for the Rail in Ulster County. We waited for over an hour and while we did not see the Rail, we heard it call several times. 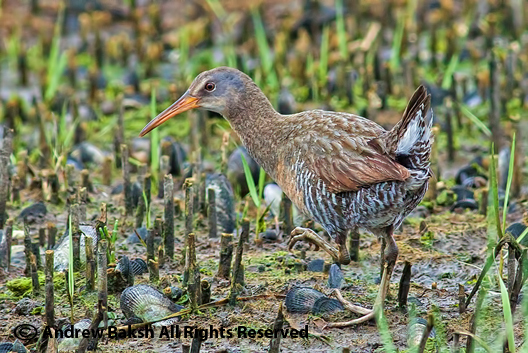 While doing our Rail watch, we picked up several good birds in the area including Common Gallinule and Least Bittern. On our way over to the Rail site we had received word of a Sandhill Crane being seen about a mile away from where we were and so we decided to give that a try. 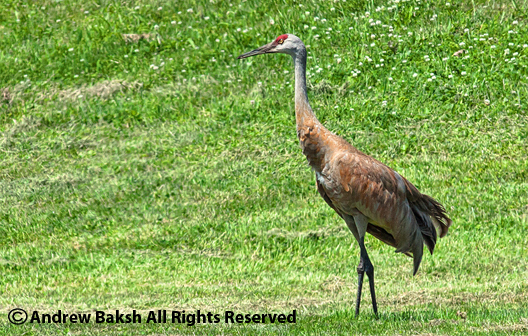 As luck would have it, we found the Sandhill Crane on a mowed lawn in someone's backyard. We watched this bird for a bit taking photos and video and marveled at the lucky resident who could claim a Sandhill Crane as a yard bird. Not as a fly over but as a bird feeding and resting in the backyard. Incredible! After a short break for refueling we headed back to the Rail spot. Tom was hopeful that I would get a look since it was a lifer for me. We settled in for the long haul, joined by Deborah Kral and George Thompson (sp). Later we were joined by a neighborhood resident. By then, Deborah left to go looking for the Crane after I told her where to look. After over an hour, the King Rail called once then went silent; a few minutes went by and suddenly it called again but this time it sounded like it had moved closer. Tom and I began doing our best imitation of King Rail calls that we could and would you believe it, the bird moved even closer. We did our imitation Rail call intermittently but for the most part remained quiet and listened and watched. The King Rail would go quiet and then suddenly let out a call and each time it sounded closer. It got to the point where the bird was so close it seemed it was right next to us, but none of us could see it. This went on for quite a while and then suddenly we saw something ahead of us which got flushed by a passing car. It was a rabbit who was contemplating crossing the road. While it was not the bird, I was encouraged because it meant we were being quiet enough for a bunny to venture out. About 10 minutes later after the King Rail calls had gone quiet, Rallus elegans walked out near where the rabbit had been earlier. I was almost afraid to breathe. 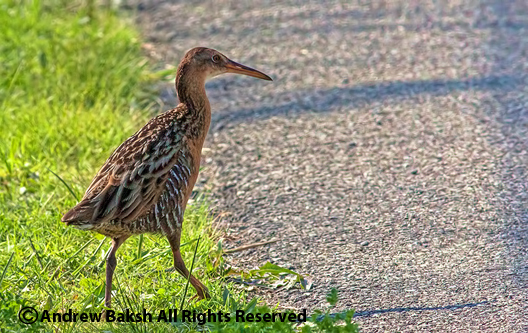 But the King Rail seemed calm and was in no hurry as it took deliberate steps and sauntered across the road. There were smiles and handshakes all around, patience and perseverance had paid off. WE WERE KINGS FOR A DAY...ok Gail was a QUEEN :)! I finally got around to some of my photos of a spring rarity in our area. 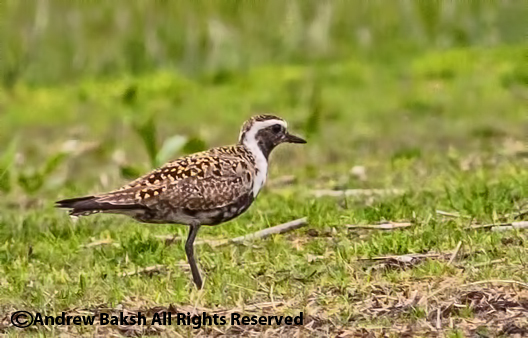 An American Golden Plover coming into nice breeding plumage has been seen at Big Egg Marsh in Jamaica Bay Queens NY. 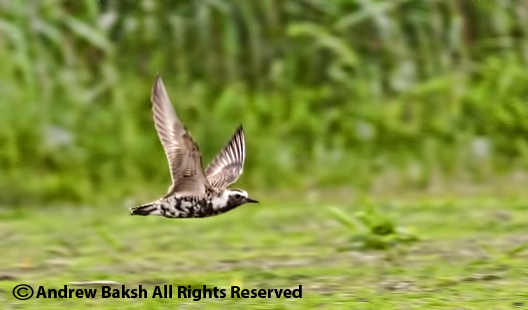 After a couple of attempts, I finally caught up with the bird on May 27th and managed a few photos. 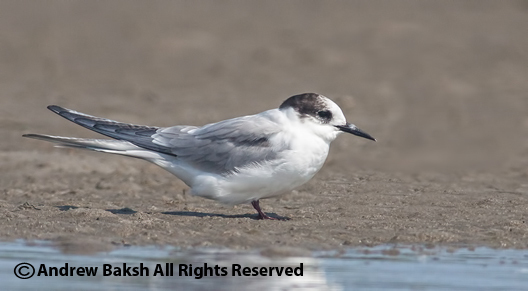 I have been fortunate enough to see AMGP on the East Pond at Jamaica Bay during the fall migration for shorebirds, but this is my first spring record in Queens. No black under the armpits! I have not seen the bird since the 27th, but there have been sporadic reports of it being seen since, so who knows it may still be around. 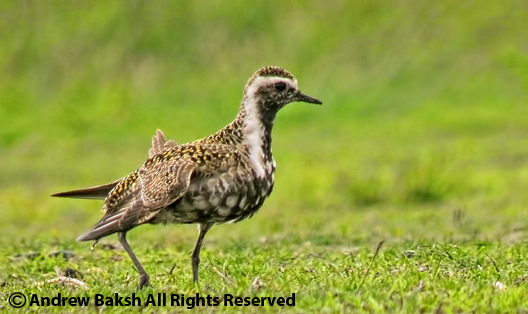 Cool fact about the American Golden Plover - Do you know this bird has one of the longest known migratory routes of over 25,000 miles. Of this, 2,400 miles is over open ocean where it cannot stop to feed or drink. It does this from body fat stores that it stocks up on prior to the flight.